How new technologies can help develop new forms of mobility? Edenred invites you to its live interactive online discussion, Let’s Talk Mobility, on Thursday, December 6, 2018 at 5 p.m. (CET). Edenred's Let’s Talk For Good concept proposes a series of interactive online webcasts that bring together prominent people and Group executives to discuss forward-looking topics. The first two webcasts were about eating habits at work (Let’s Talk Food) and the end of cash (Let’s Talk Innovation). The third discussion, Let’s Talk Mobility, will address the link between new technologies and new forms of mobility. Digital payments, mobile applications, self-driving vehicles, the “uberization” of transport, new ways of working on the move... More than ever before, mobility is undergoing major changes, and new challenges are constantly appearing for users, traditional and emerging transport operators and businesses. Anyone can attend the event and ask their questions live online. 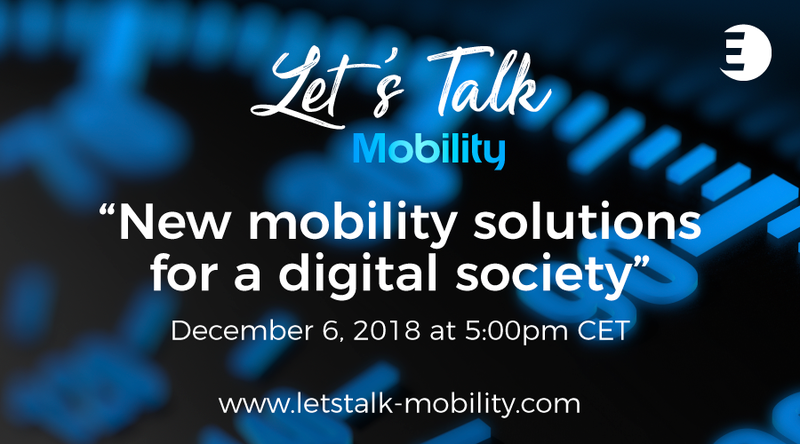 Follow the discussion live on Thursday, December 6, at 5 p.m. (CET) at www.letstalk-mobility.com, or access the subsequent replay.